This is the folktale, Two Brothers. 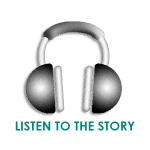 It is brought to you by Stories to Grow by. Kid-Tested, Kid-Approved Short Stories with Positive Moral Messages. This story has been featured in the COMMON CORE Assessment and the UTAH SAGE Assessment. ONCE THERE WERE two brothers who inherited their father's land. The two brothers divided the land in half and each one farmed his own section. Over time, the older brother married and had six children, while the younger brother never married. After night fell, each brother gathered a greater amount of wheat from his barn and in the dark, secretly delivered it to his brother's barn. The next morning, the brothers were again puzzled and perplexed. "How can I be mistaken?" each one scratched his head. "There's the same amount of grain here as there was before I cleared the pile for my brother. This is impossible! Tonight I'll make no mistake - I'll take the pile down to the very floor. That way I'll be sure the grain gets delivered to my brother." When the two brothers recognized the form of the other brother and the load he was pulling behind, they realized what had happened. Without a word, they dropped the ropes to their carts and embraced. This story is passed down in both Hebrew & Arab versions. In the Hebrew version, King Solomon is believed to have built the first temple on the ground where the two brothers met and embraced. In the Arab version, at the end of the story: "In the morning, each brother was amazed to find the heaps still equal, till Allah sent a prophet who informed them that their unselfish love was pleasing to the Almighty." 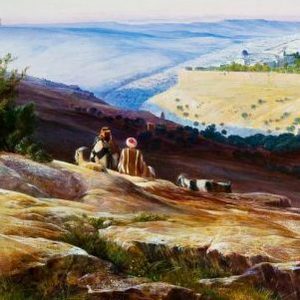 Among Hebrews, this story is often cited as a Talmudic legend taken from the Midrash, yet there is no mention of the tale in either the Talmud or the Midrash. According to the research of the late Professor Alexander Schieber of Budapest, the first time the story "Two Brothers" appeared in print was in 1851 by a French historian who claimed to have heard it from an Arab peasant. Some Jewish scholars believe the story is indeed of Talmudic origin, though for some reason it was not recorded, and that Arabs had preserved it over the centuries. It's equally plausible the story was originally Arabic (the story reflects the traditional reverence which Islam holds for the site of the Temple and its builder, King Solomon) and that it spread to the Hebrews, who then subsequently modified the tale. It's not uncommon in ancient times for legends and fables to interweave and to overlap from one culture to another.